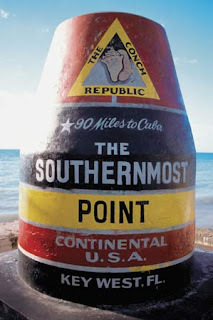 Key West Florida is one of our favorite vacation spots. This was the third visit for Fred and I and it was every bit as enjoyable as we anticipated. I don't know why Key West calls to me so strongly. I love the ocean but there are oceans in closer places. I love the warm weather but it is more than that. Maybe it is just the fact that anything is acceptable in Key West. The world feels free of judgement and critisism and I breathe more freely without that negative energy. Where else in the world can you drink a perfect margarita while applauding the sunset, be cooled by an ocean breeze being entertained by a magician, and get hugged by a drag queen dressed like Marilyn all in the same evening? Fred and I stayed in Old Town at La Pensione, a beautiful Classic Revival mansion from the Victorian era, that has been restored to it's former glory and now serves as a 9 room Bed and Breakfast. The rooms are large and beautiful, the gardens lush and tropical, and no one could have taken better care of us than Freyda, Janie and Gary did. We went to the beach almost every day. Fort Zachary Taylor and Bahia Honda State Parks are our favorites. We walked the streets of Old Town, visited the cemetery and biked around the city. We visited the Southernmost Point, the Butterfly Conservatory, and Blue Heaven. We drank hog washes, listened to the roosters and smiled at the 6 toed cats sunning themselves every where. The performers and vendors in Mallory Square were better than ever and the sunsets more spectacular than we remembered. We had our favorite meal of ropa vieja at El Siboney and tried 2 "new to us" restaurants. The Meteor Smokehouse has great ribs, pulled pork and brisket and Salsa Loca has great mexican cuisine. We enjoyed our stay. It was wonderful and restful and refreshed us. Until next time key West. I am so happy that you and Dad had a wonderful time. I can't think of anyone else who deserved this vacation as much as you two.